The National Alliance for Direct Support Professionals (NADSP) has developed a national certification program for Direct Support Professionals working in community human services. The purpose of this certification program is to provide national recognition for the contributions and competence of Direct Support Professionals (DSPs) who apply for and meet the certification standards. The NADSP certification program offers powerful benefits to practitioners, their employers and to the people they support. Direct support Professionals benefit by learning and applying best practices and evidence-based skill and knowledge in the workplace. The organizations employing credentialed DSPs can provide stronger assurances of quality to funders and people supported, and can proudly market their employment of nationally certified staff. People receiving supports from certified DSPs will have the advantage of partnering with highly trained professionals committed to supporting them using the ethical and effective interventions that they have mastered. Finally, anecdotal evidence suggests that employees who complete rigorous credential programs stay on the job longer and provide a higher quality of support. 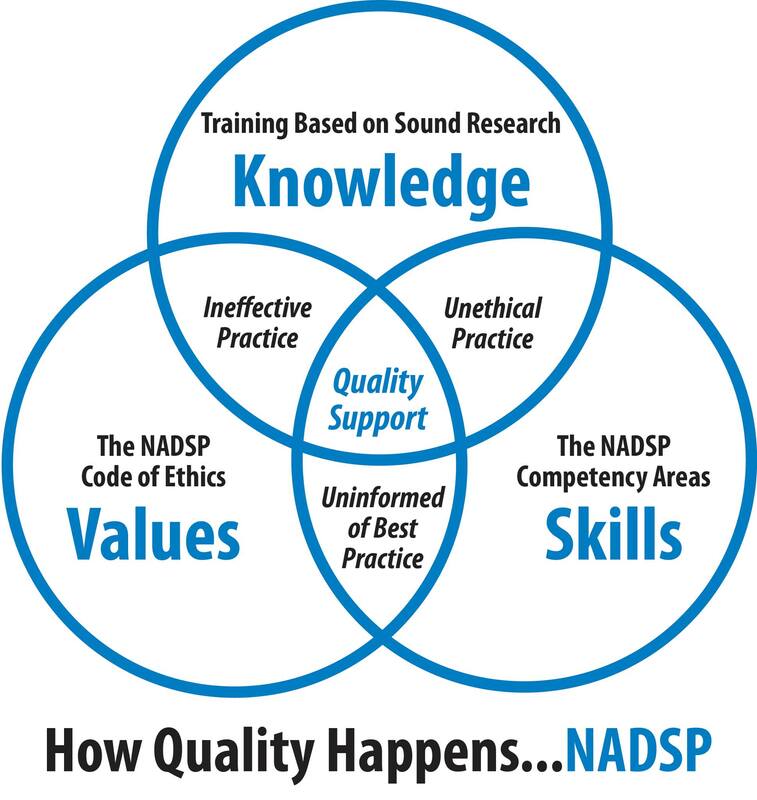 The NADSP certification program affords DSPs the opportunity to commit to the profession of direct support through its three-tiered credential program. The DSP career path begins with the Registration Level (DSP-Registered). As a DSP-Registered you will then be eligible to complete expert training in the key DSP competencies of empowerment, communication, planning, ethical practice and advocacy to become a fully certified Direct Support Professional (DSP-Certified). The third level of NADSP certification (DSP-Specialist) recognizes DSPs who have obtained specialized training and have demonstrated competence in providing specialized support to individuals with disabilities in community human services. For additional questions on certification, please contact Director of Certification and Accreditation, Dan Hermreck at dhermreck@nadsp.org or 785-328-9328. This guidebook explores what NADSP Certification is, why it’s important, and how it impacts the work of a DSP, as well as people supported. You will find detailed information about the multiple levels of NADSP Certification, along with the corresponding eligibility requirements, application components, certification expectations, and more. The DSP-R is intended to recognize people who have entered the profession and desire to have careers in the field of community human services. It is not intended to be a credential for which NADSP prescribes or sanctions DSP competence. The DSP-C recognizes DSPs who have demonstrated competence that is measured and approved by the NADSP and is split between two levels; Direct Support Professional Certified-I and Direct Support Professional Certified-II. The DSP-S represents the highest level of certification for DSPs offered by the NADSP, and is designed to recognize DSPs who have obtained specialized training and have demonstrated competence in providing specialized support. NADSP has established a Special Review Committee to review any grievances or requests for additional consideration regarding the NADSP Credentialing Program. This Committee will be chaired by an Executive Committee member and will include a minimum of one additional person who is not a member of the Portfolio Review Committee. To request that this Committee address an issue of importance to the applicant, s/he must submit a letter to the NADSP Executive Chair. This letter should specifically state the concern and their circumstances for consideration regarding the individual’s participation in the NADSP Credentialing Program. Upon receipt of this request, the Special Review Committee will review and reach a decision within 30 days.